Evaluation of faculty members’ performance will be conducted on a periodic basis, and will include annual faculty evaluation of all full-time faculty members registered on the Faculty Development Report (FDR). Criteria used for consideration include (1) teaching effectiveness, (2) College service, and (3) professional development and community service. An in-depth evaluation of tenure-eligible and specified-term faculty before the fourth week of their fourth semester at Richard Bland College, and tenured faculty at least every five (5) years following immediately upon award of tenure, will be conducted. Ratings of “Needs improvement” or “Needs significant improvement” will be accompanied by comments aimed at suggesting particular strategies for improvement, as well as the request for a meeting to discuss relevant sections. Final decisions regarding salary increases for the next contracted period of employment will include a joint review of faculty members’ Faculty Development Reports by the Chief Academic Officer and the President. If this process of annual faculty evaluations identifies a pattern of deficient performance over time, the Chief Academic Officer will conduct a thorough assessment and consult with the faculty member, the appropriate department chair, and the President. Otherwise, if a need for significant improvement does not initiate the sequence of events just described, the faculty member will see his/her department chair’s evaluation and have the opportunity to provide a written response, to be appended to the FDR and maintained with it. The document will next travel to the Chief Academic Officer for review, and s/he will add his/her response. The faculty member in question will then have the opportunity to see the Chief Academic Officer’s written comments, appended to the FDR, and have a chance to respond to these in writing. This FDR, now bearing the signatures of the faculty member submitting the document, the individual’s department chair, and the Chief Academic Officer, along with up to two responses to evaluators’ comments provided by the faculty member, is to be maintained by the Chief Academic Officer’s office. Student course evaluation data from all courses. Graduate credits earned during the relevant period of time. Evidence of public service may be included in the section with professional development, and may include evidence of participation in civic and social-services activities, memberships in relevant organizations, and/or talks given which are of public benefit, but not professional in nature. A timetable addressing a strategy for measuring progress toward improvement over the next three (3) semesters.Annual evaluations in succeeding years will specifically address progress toward improvement as established in the timetable. A faculty member who does not meet the requirements for satisfactory performance (as specified in the plan and measured by the agreed-upon timetable) may be subject to disciplinary actions consistent with College policy on such matters. Non-tenured, tenure-eligible faculty will have the opportunity to submit for evaluation a pre-tenure portfolio at the beginning of their fourth semester of teaching at Richard Bland College. The purpose of the portfolio is to provide evidence for the evaluation of teaching effectiveness, College service, and professional development and community service in a consolidated format. The portfolio will cover the first three (3) semesters and will be organized to make a case on behalf of the faculty member indicating progress is being made toward tenure and promotion. 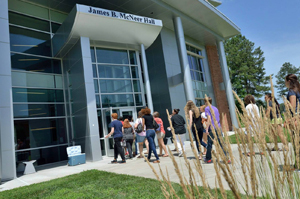 Non-tenured, tenure-eligible faculty will submit for evaluation a tenure portfolio at the beginning of their sixth year of teaching at Richard Bland College. The purpose of the portfolio is to provide, in a consolidated format, evidence for the evaluation of teaching effectiveness, College service, and professional development, and community service. The portfolio will cover the first five (5) years, and will be the basis for consideration of a granting of tenure to the faculty member. Other evidence the candidate believes may be relevant and helpful to his/her evaluation for promotion. Representation of Richard Bland College in the community. Specified term part-time (adjunct) faculty members, including those teaching dual-enrollment and online/distance classes for College credit, will have a classroom observation conducted every semester by their respective department chairs, or the designees of those chairs. The written evaluation that results from this will be discussed with each adjunct faculty member, and will form the basis for consideration in awarding future teaching contracts to the relevant faculty members.